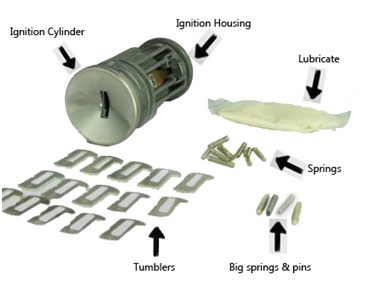 Here is a “How to” guide to replace your malfunctioning ignition switch cylinder, Please be aware that we are not responsible for any damage you may cause to your vehicle while performing this task! Look at your key blade; it should show 8 cuts, and each one will show a depth between 1 (flat) to 4 (deepest). Two consecutive cuts may be the same depth but can’t be different by more than 2 depth values. For example the key cuts may be 11323334 but can’t be 11424333 since after 1 you can’t jump to 4, or the other way around. Please make sure to keep a note with the key cuts combination you came up with for your records. Insert the matching tumblers (1-4) by the order (1-8). Each tumbler should click gently into the slot. Do not force it in it has only one way to slide in. Insert your key into the cylinder. All wafers should go flat and aligned with the cylinder, or, if your new ignition cylinder uses a side bar system, it should go down flat with the cylinder body. The side bar is a little metal bar on the side of the wafers slots that goes flat with a matching key, or stays higher either without the key or with the wrong key inserted. 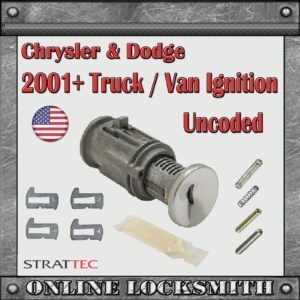 Some Chrysler ignitions use this type and some don’t. Ask us if you aren’t sure! Insert the bigger 2 springs and pins into the holes on the cylinder housing and then insert the cylinder in, turning it to lock in place. Your new ignition is ready for installation!!! 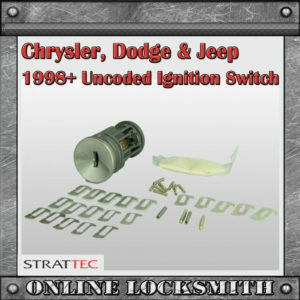 Remove all plastic covers above, under and around the ignition switch. If your key still works well enough turn the key to Acc mode and go to step 4. 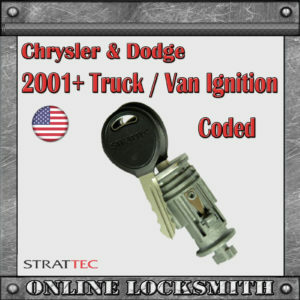 If your key does not work at all even after lubricating it and playing with it for a little bit, you can then force the ignition to turn doing the following: Insert your key into the key hole, hold only the ignition cylinder (not the key or the housing) with a pliers or locking pliers, and in one strong movement force the cylinder to turn all the way to Acc position. Find the release button and press it while pulling the ignition out. 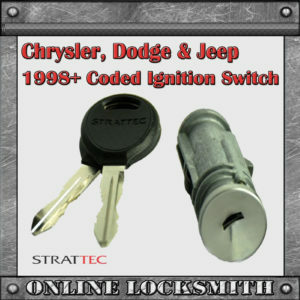 Insert your new ignition in the right position into its place. Do not use force, it should have a position that allow it to go in smoothly, and if not you are doing something wrong. Place all plastics and electronic parts back in place. You are ready to go!! !